A South African minister has criticised African leaders who seek medical treatment abroad. 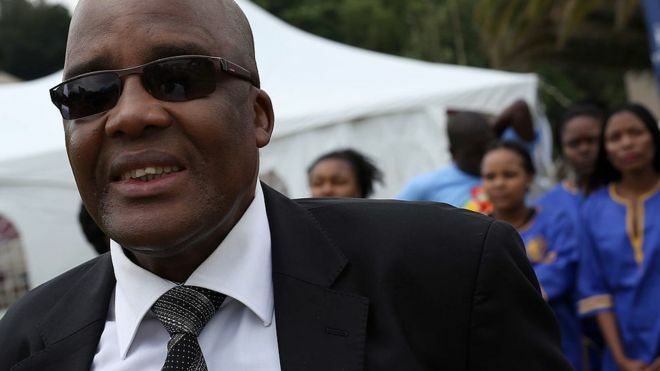 Aaron Motsoaledi condemned "health tourism" while speaking in Zimbabwe.President Robert Mugabe, who frequently receives treatment in Singapore, had left the meeting of health ministers when Dr Motsoaledi made the comments.Mr Mugabe's spokesman has said that the president's doctor is not "is not only Zimbabwean, he is actually black… He is very, very, very black".George Charamba made those comments to Zimbabwe's state-run Herald newspaper in May, insisting that President Mugabe was not turning his back on Zimbabwean medical help. Nigeria's Muhammadu Buhari and Angola's Jose Eduardo dos Santos have also been criticised for seeking medical treatment abroad this year.Africa Live: Updates on this and other storiesAfrica's 'medical tourist' presidentsMugabe 'not asleep just resting his eyes'At this week's conference Dr Motsoaledi said: "We are the only continent that has its leaders seeking medical services outside the continent, outside our territory. We must be ashamed of that." "This is called health tourism. We must promote our own," he added. Dr Motsoaledi also urged governments to increase funding to local facilities. It was the elephant in the room as over 30 of Africa's health ministers met to discuss strategies to tackle the continent's public health problems.The list of African heads of state who have recently sought medical treatment abroad includes President Muhammadu Buhari, Angola's outgoing President Jose Eduardo dos Santos, Zimbabwe's 93-year-old President Robert Mugabe, Benin's President Patrice Talon and 80-year-old Algerian President Abdelaziz Bouteflika.When Dr Motsoale made the comments in a plenary session, his remarks were met with silence from the other member states represented. Dr Motsoaledi admitted his position is a controversial one, but added that it needed to be said.